Mass General ALS nurse Katie Tee, RN (left), speaks with patient Linda Hank during a house call visit. The device on Ms. Hank’s glasses is an eye-tracker which is linked to a tablet and allows her to type and speak without using her hands or voice. Mass General ALS experts believe the new ALS House Call Program will help to change the course of medical care planning and improve outcomes for people with amyotrophic lateral sclerosis. Clinicians at Massachusetts General Hospital’s ALS Multidisciplinary Clinic are known for providing world-class care to people with amyotrophic lateral sclerosis (ALS), and they are always looking for ways to improve, based on feedback from people with ALS and their loved ones. In recent years, they have expanded the specialties represented in the clinic and taken bold steps to move care beyond the confines of the clinic using virtual visits, patient webinars, and email notifications. These improvements are paying dividends, opening new channels of communication, bringing clinicians and people with ALS closer than ever. The pilot ALS House Call program will center care around the lives of people with ALS in a new way. Yet a final boundary has remained largely uncrossed – the threshold into the homes of people with ALS. Ironically, it was only a half century ago that physicians performed most of their work in patient’s homes – now house calls are exceedingly rare. Yet for people with ALS, providing their clinic care team with a deep understanding of their home environment can substantially improve their care while reducing the burden of accessing ALS care. It could mean a welcome reduction in the number of early morning awakenings and long commutes with medical equipment in tow. 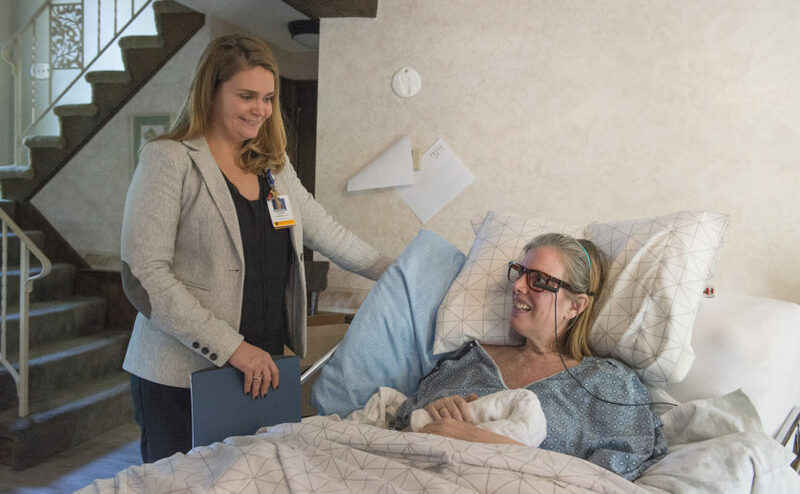 For their part, the providers in the Mass General ALS clinic believe house calls can provide critical information that can change the course of medical care planning and improve outcomes. “We are excited about this program because we think it’s the right way to care for people with ALS,” says Dr. James Berry. And now they are springing into action with support from EGL Charitable Foundation and in partnership with Compassionate Care ALS (CCALS), a nonprofit focused on supporting people with ALS in their homes. The pilot ALS House Call program will center care around the lives of people with ALS in a new way. They will be able to share their environment and daily routines with their clinicians to find optimal medical solutions to fit their lives. Whether it’s measuring the width of a hallway for wheelchair access or seeing that prepared meals aren’t lasting throughout a long day, visiting Mass General clinicians can find ways for patients to live more comfortably with ALS. And, for most people with ALS, the House Call program will supplement, not completely replace, care at the clinic. There will always be a role for the diagnostic approaches housed in centralized locations, and the Mass General clinic, one of the largest and most active ALS research sites in the U.S., is a place of research (there are more than 20 ALS clinical trials underway at Mass General) and hope for most people with ALS. The House Call program may even help bring research to people with ALS, expanding their opportunities to participate. “The ALS House Call program is an incredibly important advance in the care of ALS families,” says Ron Hoffman, founder and executive director of CCALS. The ALS House Call program will be run in conjunction with CCALS. “The ALS House Call program is an incredibly important advance in the care of ALS families,” says Ron Hoffman, founder and executive director of CCALS. “This program is unique in its combination of personalized medicine and personalized care, both of the highest quality;” says ALS advocate Daniella Lipper. Long a dream of the ALS Multidisciplinary Clinic team, the House Call program became a reality as a result of a generous donation from the EGL Charitable Foundation.